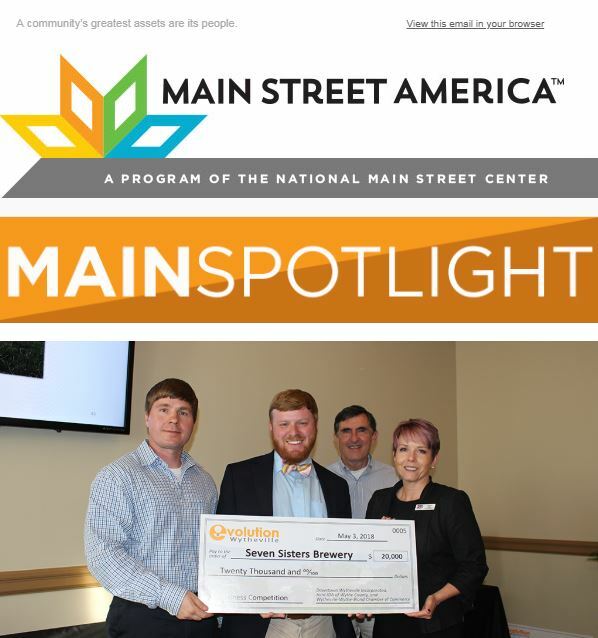 Recently, Main Street America’s #MainSpotlight featured a great article about the Main Street executive director experience from one of Virginia’s own, Todd Wolford of Downtown Wytheville Inc. It cover’s Todd’s three-year experience achieving confidence and effectiveness in his role. One of Virginia’s new directors said, “He’s like a Main Street director’s medium”. He practically read her mind and touched on all the questions that are swirling in her head as a new director and community leader. Well, my question to these folks is, “why not?” Why not change the perception of your community and the way they view your downtown? Why not create a culture that promotes bringing people together in an atmosphere that is walkable and where people can gather? Why not focus on the heart of your community and preserve the unique history from the past that many of the younger generation will not have the opportunity to know about? Lastly, what is the alternative? A vibrant downtown says a great deal about the well-being of a community as a whole. By the way, Todd’s the handsome guy on the left.